Thank you for your enthusiasm of Stoney Creek Cross Stitch Collection. Your support inspires us to continue to create the best cross-stitch patterns and publications possible. With the rising costs of publishing and mailing the magazine, we have made the difficult decision to no longer offer subscriptions. Individual magazines will still be available for purchase at your local specialty needlework store, online at www.stoneycreek.com, or by phone with a credit card. Current subscribers will continue to receive their regular mailing through the end of their subscription. Again we thank you for your continued support of Stoney Creek and all things needle and thread! 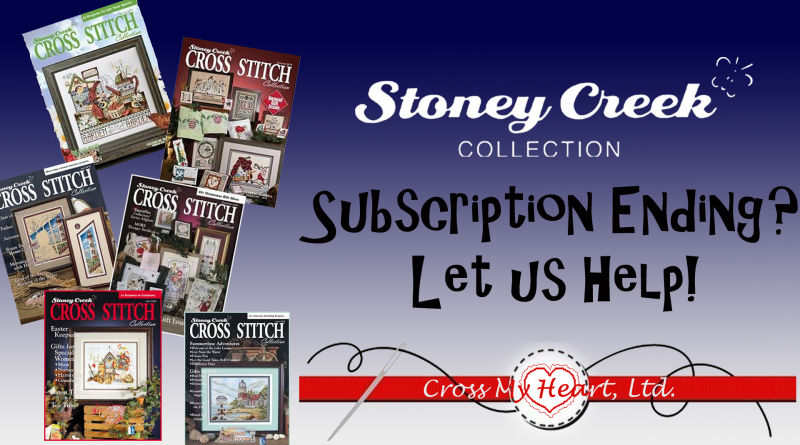 Cross My Heart would like you to know that we do carry Stoney Creek Magazine and we would love to offer you a mock-subscription option. Give us a call at 614.442.0820 or stop into the store and we will set you up on our subscription list to be alerted the next time a new magazine comes out. You will have the chance to pick up your reserved copy either in the shop, or, we can ship it to you for an additional charge. We are delighted to be able to offer you continued service of a beloved magazine.